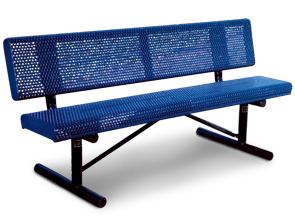 This thermoplastic coated perforated steel park bench features small perforated holes that provide a smooth surface and rolled edges for all around extra comfort. The supportive back is smooth to the touch and makes relaxing at parks an even more enjoyable experience. 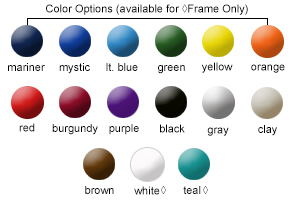 The durable thermoplastic coating is corrosive-free and will maintain its vibrant appearance for years to come. Benches are 18" high and come in 4', 6', and 8' lengths with two durable 2-3/8" legs that are available in surface, in-ground, and portable mounts. Optional grout covers can be ordered with the in-ground and surface mounts for added visual appeal, and both the powder-coated leg frame and bench back/seat come in a variety of colors. Bench back and seat are finished with a lightly textured matte Polyethylene in the color options as shown.